Large enterprises make millions of dollars in disbursements every month to employees, businesses, partners, and customers. Each of these types of disbursement is subject to regulatory and recordkeeping requirements that are different from one another and constantly changing, making payment compliance a constantly evolving field. In a recent study¹, 90 percent of businesses said that regulatory compliance will seriously affect business planning, and 45 percent of CFOs listed compliance as their biggest growth challenge. As 2018 wraps up and businesses turn their attention to process improvement and business growth in 2019, it’s essential to keep up with compliance changes. Here are four ways businesses and staff members in HR and finance can improve payment compliance in 2019. Payroll is one of the most significant recurring disbursement needs for businesses. It also represents one of the primary interactions between employers and employees. In an environment where legislation and regulatory requirements change rapidly and constantly, it is vital that companies keep payroll staff and employees throughout the organization up to date on payroll changes. For example, recent changes² have been made to retirement plan contributions and benefits under the 2019 Pension COLAs. An increase to the Social Security Wage Base and changes in tax regulations will affect take-home pay for employees throughout your organization. Regular communication to employees will help to ensure that they understand and anticipate changes to their financial situation; and regular communication to responsible staff in the legal, finance, and HR teams will help to ensure compliance in payments and recordkeeping. 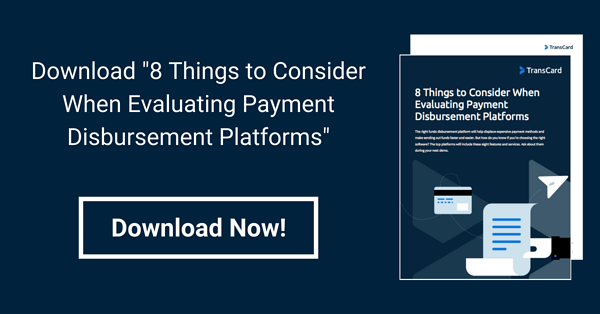 As more companies move away from paper checks to digital disbursements, the platforms that support those payments should be considered as a valuable tool to help manage compliance activities. Funds disbursement platforms that are operated by third-party partners are evaluated for compliance and can even “take over” or automate some compliance activities for businesses, helping ensure processes are in line with regulatory requirements and are updated for the business as necessary. In some platforms, businesses’ main compliance and payment obligations are complete as soon as funds are transformed to the funds disbursement solution. Payees bear the burden of choosing payment methods and timeframes, while the compliant platform absorbs some of the regulatory burden. Further, a funds disbursement platform tracks and records much of the necessary data in the form of reports and analytics to help managers stay on top of compliance. Payment compliance means balancing large amounts of critical data, having different processes that speak to regulations that can vary by type of payment and by geographic location, and that may change on relatively short notice. A third-party platform that manages changes to compliance requirements is important, but it also benefits an enterprise to consider a platform that helps relieve burdens on staff by automating processes and providing detailed reports for compliance purposes. Automation may include tasks related to escheatment, PCI, bank security, state regulatory and reporting requirements, among others. The more repetitive tasks that can be moved to automated processes, the more time employees can devote to higher level, strategic objectives. It can also help to reduce the potential for human error, ensuring that compliance processes and reporting are timely and accurate, and that nothing falls between the cracks. Payment compliance varies greatly depending on federal, state, and regional regulations; and due dates can vary widely depending on the location of the employee, payer, or recipient. Creating and maintaining an up-to-date calendar as a centralized repository of compliance due dates helps enterprises to stay on top of varied requirements, reducing the potential of a missed deadline and the attendant investigations, fees and penalties that arise. For improved transparency, give view access to your compliance calendar to any employees involved in payment and disbursement processes, even if they’re not directly involved in compliance. Their tasks may impact compliance procedures, and additional visibility into how their work affects their colleagues and your business can help improve understanding and efficiency. Payment compliance is a complicated activity for enterprises of all sizes, particularly large enterprises that process a large volume and variety of payments. A recent survey³ of compliance professionals found that 70 percent of firms expect the focus on managing regulatory risk to increase over the coming year, due to continued regulatory changes and the ongoing focus on culture and conduct risk. To manage complex compliance requirements in a changing environment, keep up to date on both current regulations and upcoming changes. Make sure employees are empowered with the knowledge they need, as well as tools that help alleviate their workload. Payment solutions companies can help, partnering with businesses to create custom platforms that make employees’ processes more efficient. TransCard’s mission is to provide innovative payment solutions that reduce your regulatory, time, and cost burdens. Our SaaS funds disbursement and management platform is the only consumer choice option on the market to give payees to choose from nearly a dozen different ways to receive their funds. It’s also the only platform to absorb regulatory compliance burdens for escheatment and PCI. TransCard works with all major debit card networks including MasterCard, Visa, Star, Pulse, and NYCE, along with more than 225 issuing banks.